A massive thank you goes to Babyology reader Grace for introducing us to the fabulously charming work of Sydney-based artist Charlotta Ward. Be it by way of custom canvas artwork or a magnificent mural, if you have an idea you want to see spring to life, Charlotta is your (very talented) woman! Swedish born and now residing in Sydney, Charlotta Ward has her artwork and talent gracing the walls of many children’s rooms in countries all over the world. 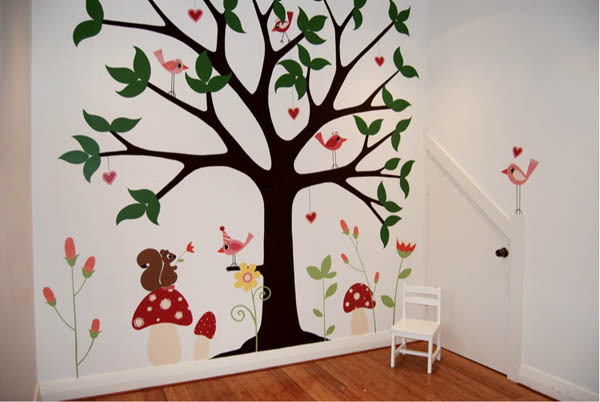 Just take a look at this spectacular mural above, painted for one very lucky family! Canvas artwork is Charlottas’ main focus and the personalised ‘Fantasyland Series’ is popular with her smallest and youngest clients for its important and adorable details such as lollipop trees, happy squirrels and pink lions. Murals, personalised cards and decorative accessories are also available on request. Prices start at $600 for smaller murals, with made-to-order canvas art from $100 and spectacular custom ‘Fantasyland Series’ pieces (as pictured top of this post) from $400. You can see a portfolio of works and contact Charlotta through her blog, Charlotta Ward.